Anonymous has been looking into the association between MTHFR and gout. This may be a productive new avenue to explore and I'm going to put links and theory under this category on this page. In VERY simple terms: The methylation cycle converts homocysteine into methionine which is then used to make the methyl donor SAMe. Once the methyl group has been donated, we are left with S Adenosine Homocysteine (SAH) which is then converted to homocysteine. For many people (mostly of European descent) this cycle does not work properly due to several mutations in the MTHFR gene. 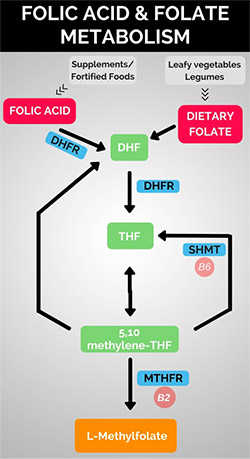 The MTHFR mutations result in a reduction in the amount of the active form of folate L-F-MTHF which in turn inhibits the activity of the MTR gene and results in a build-up of homocysteine. This build-up of homocysteine can back feed to create more SAH which can “perhaps” lead to raised levels of uric acid. It is worth noting that many people switching to a carnivore or zero carb diet will by default increase their consumption of foods containing methionine and hence could exasperate any existing issues with the methylation cycle and “potentially increase their risk of gout”. See the 4-part Youtube series by Dr. Neil Rawlins for a good introduction into the MTHFR gene and its mutations. The man-made substance Folic Acid is now added to many foods. However, for those with MTHFR mutations this is a disaster as Folic Acid can block the receptors for the active form of folate L-5-MTHF. Most people can successfully treat high homocysteine levels by taking L-5-MTHF supplements and Hydroxo or Methyl B12. Methylcobalamin (B12) is the other main input to the MTR gene. See the work of Dr. Amy Yasko for more information on how to treat MTHFR issues. In his paper “Reversal of cognitive decline: A novel therapeutic program” Dr. Dale Bredesen recommends Methyl-B12, Methyl-Folate, P5P and if necessary TMG to treat high homocysteine levels. Significant association between methylenetetrahydrofolate reductase 677T allele and hyperuricemia among adult Japanese subjects. ​Although folate occurs in naturally in some foods, and folic acid is used to fortify others, approximately 60 percent of the population in the United States have genetic variations that make them unable to utilize these nutrients. These variations do not allow the MTHFR enzyme to function properly so methylation of folate does not occur. Without this activation step, folate cannot be used by the body, resulting in negative health side effects and the possible inability to maintain a healthy mood. This deficiency usually occurs because folic acid, the most common form of folate in supplements and fortified foods, must be converted to its active forms to be used by the body. The enzyme needed to convert folate to its active form, methylfolate, is called methylenetetrahydrofolate reductase (MTHFR). The problem lies in the fact that almost half of all people have genetic variations that reduce the ability of the MTHFR enzyme to make this conversion. Folate deficiencies are tied to a host of conditions. For people with MTHFR gene variations, supplementing with the already activated form of folate is far more effective in providing this form of folate than introducing the pre-converted form to the body through typical folate supplements. L-Methylfolate supplements provide the active form of folate naturally present in the body and available for biological action. This image illustrates the folic acid activation cycle. The other forms of vitamin B9 are folic acid and folate. Folate is often called the natural form of vitamin B9, but it actually refers to a family of different compounds that occur naturally in some vegetables. Folic acid is the supplemental or "synthetic" form of vitamin B9 and is typically the first line of treatment for folate deficiency and related health conditions, such as high homocysteine and neural tube defects. Any folic acid we ingest must be metabolized (converted) into Dihydrofolate (DHF), Tetrahydrofolate (THF), and then finally into L-methylfolate to be used in the body. Once in this form it can be transported into cells, tissues and even across the blood-brain barrier. But issues can arise during metabolism for those with an enzyme issue, such as an MTHFR mutation. Methylation, choline and the link with fatty liver and a carnivore based diet.